Oh Pinterest, you’ve done it again: delicious, festive, and easy recipes to celebrate Thanksgiving! If you need a last-minute signature cocktail or an easy dessert recipe to bring to your Thanksgiving feast tomorrow, we recommend these seasonal treats. 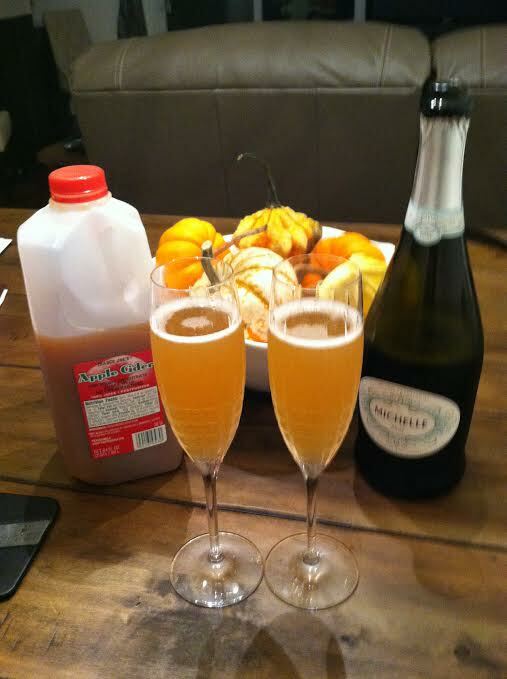 Apple Cider Mimosa, is a different take on the favorite, traditional, and boozy brunch drink! We adapted this recipe from The Cookie Rookie. Brut-we used Michelle Brut, but your favorite sparkling wine or champagne should be just as tasty. We eyeballed a shot of apple cider and filled the rest of the flute with the sparkling wine. Voila! round cookie cutter 4 inches in diameter- we used the pumpkin pie filling can to cut out the dough. 1. Prep your dough. Using a small round cookie cutter or base of a can, cut out circles from your two 9-inch pie crust doughs. Use the pumpkin can to cut out perfect circles! 2. Place each circle into a pre-greased muffin tin. Press them in, letting the sides come up for a fun look. Score the bottom of your dough with a fork to keep the crust from bubbling up as it cooks. 3. Pour your filling into each muffin tin cup. Fill them to the very top. We had leftovers of the filling! 4. Bake your muffin tin pumpkin pies at 425 for about 15 -20 minutes. Keep an eye on them! 5. Let these cool on a wire rack for at least an hour to let the pumpkin filling set. 6. Add a dollop of whipped cream to each individual mini pie. 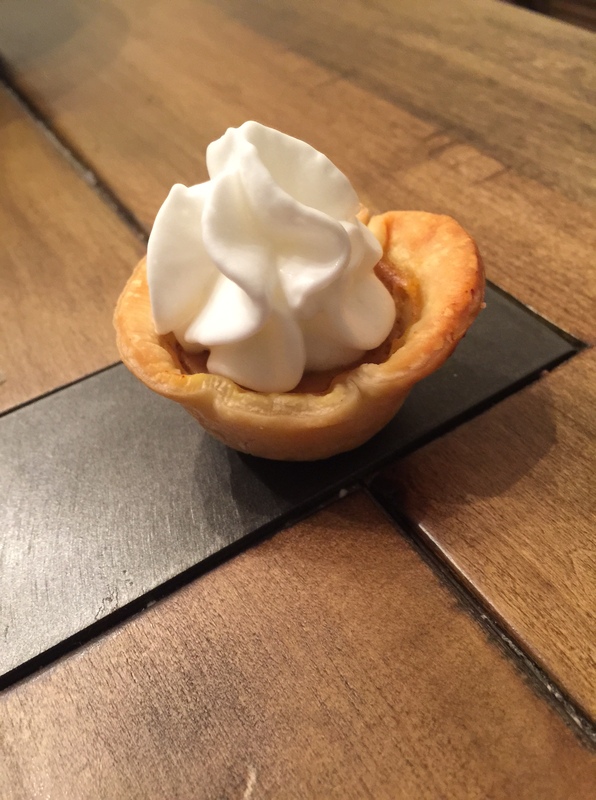 The cutest bite of pumpkin pie! This Thanksgiving, we are thankful for our life long friendship. And the delicious sips and sweets we’ve shared with you so far this year. Happy Thanksgiving! And, Happy Fall Sipping and Baking!